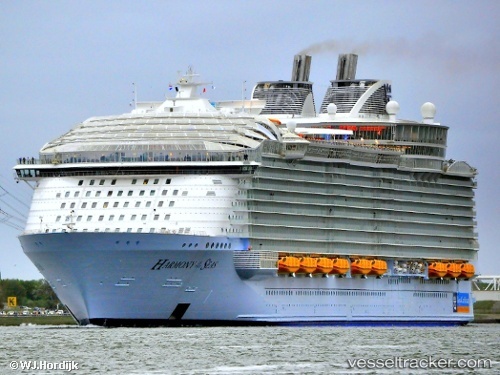 After the "Harmony of the Seas" had berthed in Labadee on Jan 11, 2019, at noon the Alpha Code was called out after a passenger who had been on board with his family, fell from deck 16 onto the pier. The 16-year-old boy had been trying to climb from an eighth-deck balcony because he didn’t have his room card. Laurent Mercer, from the French-speaking Wallis and Futuna islands northeast of Fiji, lost his footing while trying to climb from an adjacent balcony and fell onto the concrete pier below, sustaining major head injuries. The ship’s medical team attempted CPR, but the boy was pronounced dead from major head trauma at 11:42 a.m. The ship was in the midst of a seven-day Caribbean cruise. The US Coast Guard suspended the search the search for Aaron hough on Dec 27 at approximately 2:30 p.m. 267 miles northwest of Aguadilla, Puerto Rico. Coast Guard rescue crews were composed of Coast Guard Air Station Clearwater HC-130 Hercules airplanes, Coast Guard Air Station Miami HC-144 Ocean Sentry airplanes and the crew of the Coast Guard Cutter "Resolute (WMEC-620)", homeported in St. Petersburg, Florida. Crews searched for approximately 83 hours covering 3,707 square miles. A US Coast Guard crew based in Clearwater was searching for a crew member of the "Harmony of the Seas" went overboard 267 miles off Puerto Rico on Dec 25, 2018. The 20-year-old British entertainer Arron Hough was missing. A HC-130 Hercules aircraft from Clearwater and the crew of the Coast Guard Cutter "Resolute" as well as a HC 130 Hercules aricraft of the Air Station Clearwater HC-130 started searching for the entertainer. The cruise ship was off Aguadilla, Puerto Rico. It was coming from Port Everglades in Fort Lauderdale.